1. Scan the QR code to download the APP V380, and open it with Local User. 3. Connect the AP WIFI in mobile network setting (Device ID Name start with MVxxxxxxxx),iPhone will takes 40~60 seconds, when it connect succeed, the signal 4G will change to Wifi icon. 4. Back to app, Click 'Add networked Device' on APP (the Device ID is on the bottom of the camera)then Press Add to list. Then check the signal again whether it changes to Wifi icon. If it works, you can view now. First time will ask you set a password. 5. Connect to Router mode. Click the "device-network settings-station mode", choose your wifi and enter the password. Then save it. If there are ask a prompt, please agree with it. 2.This camera only support 2.4G Wi-Fi, it does not support 5G Wi-Fi at present. 3.This camera doesn't support special character in your Wi-Fi password or Wi-Fi name, please change it and re-connect. 4.If you have entered the Wi-Fi password and no voice prompt, please ensure the DHCP of the router is ON. 5.If you want to view previous video, please ensure the camera has been inserted the SD card so that it could store the video and playback. Wifi Smart Camera:Connect with AP/Router Mode to remote view via our app in your smartphone. provides complete surveillance with 1080P FHD resolution and a horizontal 185° field of view; IR night vision up to 30 feet.Fish-eye lens IP Camera, support 360° panoramic video recording. 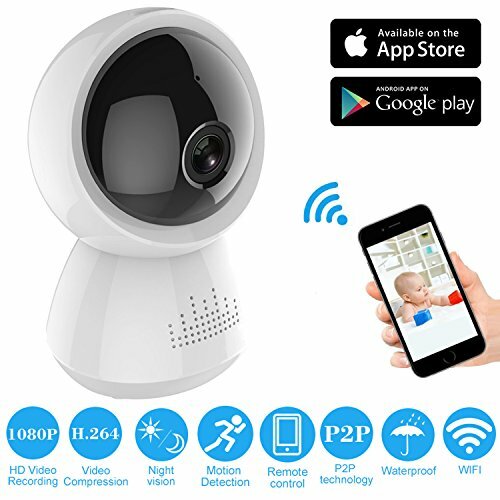 A surveillance housekeeper: Use this wifi camera as a baby monitor or Pet camera to view your baby and pet's activity and safety. No matter where you are, Monitor your home the whole day through the motion detection, send alarm alerts timely to your mobile devices or email anytime, anywhere. You can remote view and control the wireless camera. 2 Way Talk & Night Vision: Supported video and voice live camera contact with.Built-in sensitive mic and speaker, easy to monitor and communicate with loved ones or pets, deeply feelings with real time communication. The camera build in a "Night Vision" feature,when at night,it can capture the ultra clear night living image of every moves within 16 feets under the camera in your house and help you watch out the thieves,giving you a peace of sleep at night. Wall Mounted Bracket Holder: Our camera package included a wall mount kits, that you can hold the dome IP camera in the wall or anyway. Made of high-quality plastic. Sturdy, tough, and fully adjustable. Easy to install.